the Tri-head bolt is also known as a Triangle Screw. Its uses include anti vandal and anti theft protection for items such as waste bins in public places (i.e. on-street or in parks), as wheelie bin lid locks, etc. The Triangle Screw requires a matching Tri-head driver tool to tighten or release, however these are intended as a low security anti tamper fixing product, designed primarily to deter vandalism or casual misuse of the protected item. 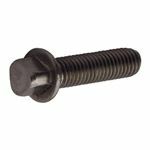 Not intended for high security applications, the Triangle Screw also sometimes called a Tri-head bolt, is a security bolt with a flanged triangular shaped head. These bolts are done-up and released using a matching Tri-head Key wrench ( a triangular shaped socket formed on the end of an "L" shaped key wrench bar). Securing the decorative covers which lock onto the waste bins provided in public parks or which are mounted at intervals along pavements. With the decorative cover in place, the unsightly working element of the waste bin is concealed, as well as the contents being protected against windy weather conditions, or vandals simply emptying the contents onto the grass or pavement. Tri Head bolts are also often used to keep Wheelie Bins Locked to prevent unauthorised users from dumping their waste rubbish in the bin (a serious problem in some areas for commercial users). Access hatch covers on lamp posts and other street furniture also employ tri-head bolts to prevent tampering with internal wiring, etc. With all the applications mentioned above, authorised users such as official refuse collectors, etc, will carry the appropriate security key wrench to allow them access as required.